Birmingham, AL (7 hour drive from Charleston) - my hometown to my parents' house, house I grew up in, for Thanksgiving. Joining us was my family and my aunt and uncle and my cousins. 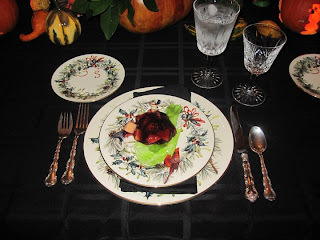 I was so excited that Bradley, my fiance, went home with me for Thanksgiving this year. 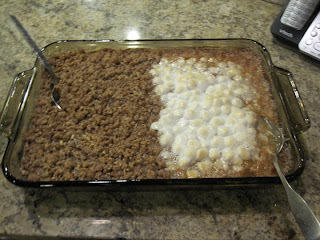 He was a little bummed to be missing his mom's Thanksgiving for the first time, so we tried to make it as special for him as possible. My mom even asked him to carve mini-pumpkins for her table centerpieces...which he and my Dad preceded to do...with power tools. Men. 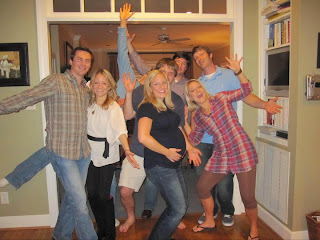 All the cousins - my sister is due in February! Her pregnancy is going by so fast! 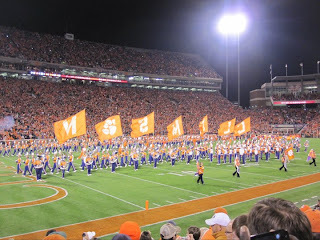 Clemson, SC (4.5 hr drive from Birmingham) - every other year I leave home from Thanksgiving early (much to my mom's chagrin) to trek up to Clemson for the big rival game, Clemson vs. Univ. of South Carolina. That's me and my best friend, Jtay (her nickname). In hindsight, I think we should have stayed in Birmingham - but I say that only because it was REALLY cold and because the game was so pitiful, i.e. 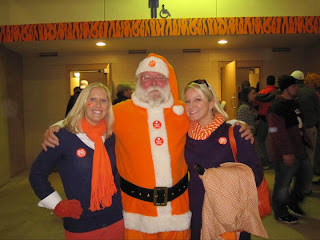 Clemson played awful and USC whooped up on us. If we had not gone, it probably would have been the reverse. 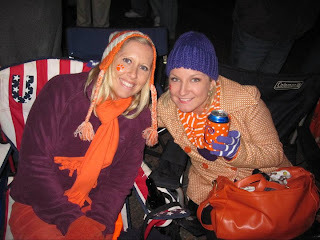 Oh well...we did have fun tailgating all day and hanging out with friends. Disney World, FL (9 hr drive from Clemson) - Bright and early Sunday morning, Bradley and I woke up and hopped in the truck again for the longest trek of our journey so far down to Disney World. We met his entire family there and spent the next four days immersed in all things Disney. I hadn't been since college and Bradley hadn't been since he was 6 yrs. 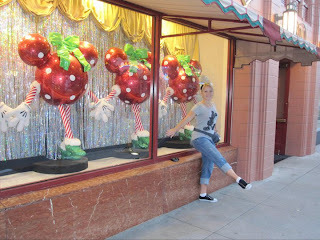 old - so it was fun seeing how much Disney has changed. 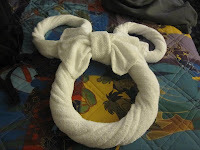 It's amazing how easy it is to get wrapped up in the Disney spirit. It was wonderful. The weather was perfect (low 80's beginning of week, high 60's end of week, sunny) and we squeezed in about everything imaginable that we wanted to do. Bradley's older sister is like a Disney pro and had our trip all planned out - we had meal plans already set up, meal reservations, etc. 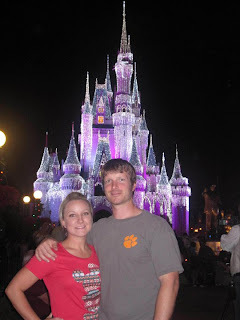 We visited Magic Kingdom, Epcot, Disney Studios (formerly MGM) and Animal Kingdom. 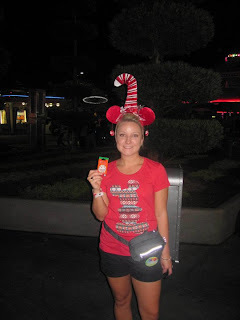 Our favorite part of the entire trip was the night we went to Mickey's Very Merry Christmas Party. They close down the Magic Kingdom and only let in people who have tickets to this Christmas celebration. The entire park is decorated already with all things Christmas - but they go a step further with this celebration. It included access to all of the rides, but they had a Christmas parade, the most amazing fireworks show I've ever seen and they handed out unlimited free hot chocolate and sugar cookies the entire night (7pm to midnight). Plus...they made it snow on the main street! 1) Everyone moves in Disney at what we've coined "The Disney Pace". Even though we ate pretty unhealthy the entire time we were there, I'm pretty sure we maintained our weight or even lost weight. Everyone is speed walking everywhere...and you walk from the time you wake up (7am!) to the time you collapse exhausted onto your hotel bed (midnight-ish). 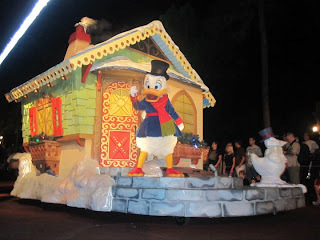 2)Disney is amazing at how they make everything seem like magic - from processes to 'herding' the crowds to setting up and dismantling parades in seconds - they are truly amazing at what they do. It's brilliant. So many companies could learn a lot about process improvement from Disney. We heard they offer 'behind the scenes' tours of the underground workings of Disney...but we both agreed that we would never want to do that. Why spoil the magic for yourself? 3) If you can go to Disney World with a five year old...do it. Five years old is the dream age for a child to go to Disney World. One of Bradley's nieces is five and it was so fun watching her at the parks - every character was real to her and her face was always lighting up. It was just as fun experiencing it through her eyes as it was to be there ourselves. 4) You become low maintenance - when you're waking up at 6:15 am to make your Princess Breakfast in the castle reservation, and not getting back to your hotel until midnight that night... you learn to not worry so much about your appearance... which if you know me, can be a challenge. I showered at night, woke up in the mornings and usually wore my hair all pulled up, little makeup, and always...always... sneakers, no matter what the outfit. I actually had cute outfits planned for each day...but you soon realize that it's t-shirts, jeans or shorts, and sneakers - comfort is key. 5) Do NOT mess with parents and their strollers. Goodness gracious I almost died several times dodging parents wielding these speedy weapons in front of them. 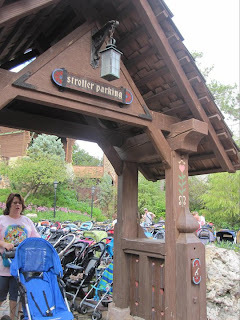 And I don't remember stroller parking lots from the last time I went to Disney...but man oh man are they everywhere in the parks now. Guess when I go back and have kids I'll be more empathetic to the stroller thing. 6) There are a LOT of people riding motorized scooters in Disney parks who should definitely NOT be riding scooters. I don't know what you have to prove to get a scooter, but I was really taken aback by the amount of people riding motorized scooters through the parks (and in the stores, and in the ride lines, etc.). Now I'm not heartless...if they have an ailment or are elderly, I get it... but we saw several folks that looked our age, healthy (well, smoking cigarettes, but..healthy enough) and average weight riding around on a scooter. Really? Are people just that lazy? They'd have their three year old sitting on the front with them, riding along. Well that's teaching them healthy lessons at an early age. :-/ In our hotel parking lot, we actually watched one lady (cigarette dangling from mouth) ride her scooter to her car, back it up to the trunk, get off the scooter, lift it, put it in the trunk, then walk around to the driver side and get in the car to drive. Maybe I'm cynical...but seriously? That was probably my only complaint the whole trip about Disney - I hope it becomes an issue where Disney will put a wrangle on scooters. 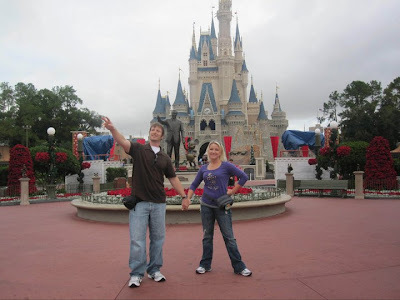 7) Why did we not intern, co-op, or just work over a summer at Disney World when we were in college? Bradley's older sister was a dancer growing up as well, and we were both talking about how awesome it would have been to spend a semester working at Disney as a dancer, performer, character, etc. I have close friends who did the Disney semesters while we were in school and they still rave about it today. Opportunity lost - I'm pretty sure they don't hire nearly 30 yr. olds. If you're in school now and you love Disney... do it! 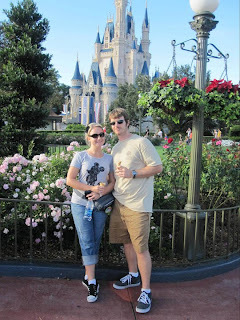 9) Visit Disney in the off-season. We hardly ever waited for rides, transportation, etc., which allowed us to squeeze in more fun stuff. I could not ever imagine being there when it's packed and hot...no way will I ever go other than off season months! 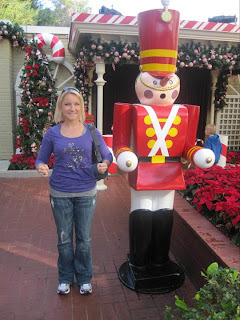 And we loved that the parks were covered in Christmas decorations. 10) Your hotel doesn't matter - not exactly anyways. We stayed at Disney's All Start Movies resort. It was way cheaper than the large resorts that are actually 'in' Disney World... way cheaper. 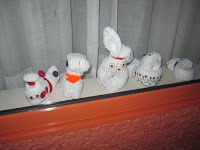 It was still a Disney themed resort and we had Disney 'towel' characters each day from our cleaning ladies like you get on cruises. But the room wasn't much to write home about - two small double beds, a 1990's style 20 inch TV with limited channels, and a small bathroom. But the only time we were ever in our hotel was the six or so hours we were there to sleep. That was it. So we both agreed that next time unless we're miraculously wealthier, we'll keep the same hotel or something similar - hotel isn't an important factor of your Disney experience. 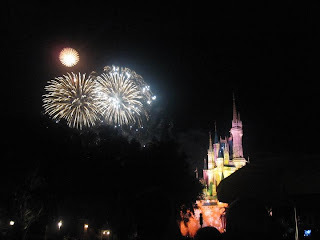 11) Return from a long Disney vacation on a weekend...with days left. We drove back to Charleston on a Friday (6.5 hour drive). I can't even explain what a relief it was to have Saturday and Sunday to unpack, do laundry, and just relax! 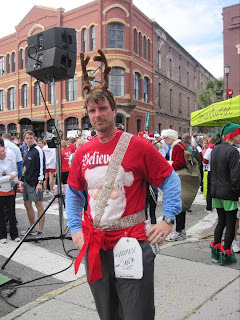 So I did spend most of Saturday and Sunday doing nothing but a staycation from our vacation...but we did plan one thing that we knew we would probably be tired for, but we didn't want to miss... Charleston's Reindeer Run 5k! 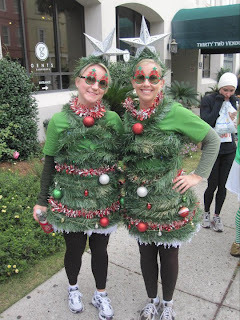 Jtay and I dressed up as Christmas trees. Before I left for my marathon vacation, we went to the dollar store and purchased all of this random stuff and created for ourselves some pretty creative and fun costumes. The lights on our costume blinked! And yes, we ran the entire race in these...lol. We even won the group costume contest...coming in second place! :) I saw our photo on the local paper's website, and we've had several people tell us we were on the local news... ha ha. Bradley was Santa's gift to women...and he got a few laughs as well. And yes...sadly..his costume was my idea for him, lol. He wasn't even planning on dressing up. His gift tag says "To: Women, From: Santa". P.S. 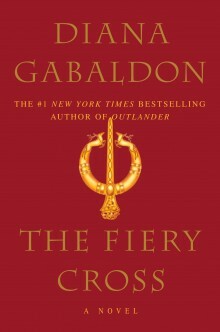 Please come back tomorrow and visit my blog - I'm hosting my very first giveaway and the prize is pretty awesome, so you don't want to miss out! Yay! My parents were never happy to see me leave to head to the Egg Bowl at Thanksgiving let alone not show up because the game was on Thanksgiving a couple years and at home.